Get Your Dog Ready for Summer with these 7 Must Have Dog Summer Tips! From doggles to pet sunscreen, flea and tick preventative measures, a good dog friendly water bottle, life jacket and more! Along with warm weather, sunshine, and green grass comes fleas and ticks! Protect your pet with FLEA and TICK supplies. There are a few different products on the market, read about each and decide what is best for your pup. We use the monthly application and find that it works well! With the rain comes mosquitoes and mosquitoes are the cause of heart worms! We suggest giving your dogs heart worm pills year round but for those that don’t, please make sure your pup is on heart worm meds to prevent the horrific condition. Although heart worms are can ‘cured’ it is a lengthy, expensive, and overall unnecessary process so spend the money to get the monthly doses for your pup! Just like humans need sunscreen, pets do too! Many pets get skin cancer as they get older – especially for the short haired breeds like Italian Greyhounds. Protect your pups notes and other exposed areas when they are enjoying a lengthy day of fun in the sun with some pet sunscreen! If you have a backyard dog that enjoys romping around in the warm weather, get them a cooling bed – it is an elevated bed that allows air to go under them as well as above them. It will help to keep them cool on the hot days! Going to the beach, lake or out boating? Be sure to suit up your pooch with a dog life jacket! We personally enjoy the Outward hound life jacket but any good fitting pet life jacket will suffice. Even if your dog is a good swimmer, it is better to be safe than sorry. As can happen with humans, dogs can become disoriented, tired, or unconscious and although s/he may be a good swimmer – under those conditions they may drown. Prevent it and suit them up! Any stylish pup needs a good pair of sunglasses, think about getting some doggles (yes, doggy goggles) for your pet to sport this summer! S/he’ll be the bark of the town! 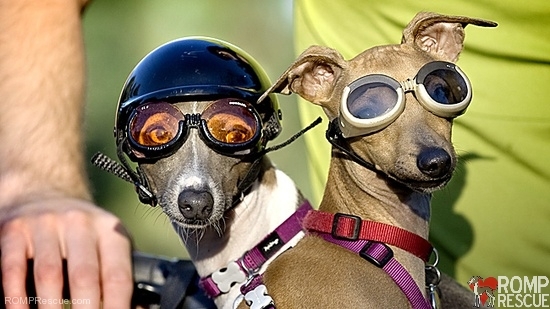 It prevents your pups eyes from wind, UV light, dust and dirt! Any outdoor dog needs to stay hydrated and cool to prevent heat stroke and dehydration. 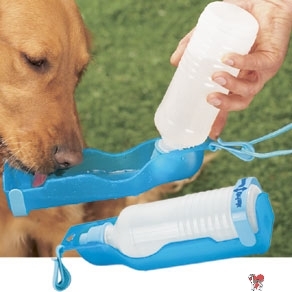 We love these water bottles with built in dog bowl! They are easy to tote along, easy to use, and sanitary! We hope you use these dog summer tips and keep your pet safe, happy, and healthy this summer! This entry was posted in ALL, Tips and tagged chicago, cooling bed, dog, dog goggles, dog life jacket, dog summer, dog sunglasses, dog water bottle, dog waterbottle, doggles, doggy, doggy goggles, doggy sunglasses, dogs, dogs summer, DW-handi_drink, flea and tick, greyhound, heart worm, ig, iggies, iggy, itailan, italian greyhound, Italian greyhound doggles, italian greyhounds, life jacket, lifejacket, pet, pet sunscreen, pup, pups, rescue, summer dog, summer dogs, sunscreen, water bottle, water bottle dispenser, water bottle with dispenser. Bookmark the permalink.